Visitors to the International Health, Racquet & Sportsclub Association (IHRSA) Convention and Tradeshow in Los Angeles, March 15 and 16 will be the first to experience the Spinning® App and Spinning Tracker Website. "The new app lets users track workout results while targeting specific heart rate zones..."
Mad Dogg Athletics, the creators of the Spinning® indoor cycling program and Digifit®, a leader in mobile wireless health and fitness solutions, announced the launch of the Spinning® app for the iPhone, iPad and iPod touch and the Spinning Tracker website, http://www.spinning.digifit.com, today. The new app and website offers users a complete system for heart-rate and cadence tracking as well as a progress-management solution for fitness trainers, the new Spinning app enhances the experience for all users and helps drive optimal results. The new Spinning app creates a highly-motivating interactive cycling experience where heart-rate, cadence, caloric burn and several other metrics are measured by the app for reference during and post workout. Each Spinning session is digitally documented and instantly transferred to a personalized online Spinning Tracker account where users can view, share and edit exercise results. The new platform is compatible with a wide variety of health sensors for tracking exercise with other key health metrics such as weight, blood pressure, sleep and steps. It offers users the unique ability to create customized workouts based on heart-zone training and music. Users can tailor routines based on pre-arranged Spinning Energy Zones™ or develop personalized heart-zone targets for customized results. Not only will this app delight end users, but it offers a progress-management solution for health clubs and instructors looking to enhance a client’s fitness experience through customized goals to deliver highly-targeted results. The Spinning app is now available for $1.99 in the App Store for the iPhone, iPad, or iPod touch and coming soon to Android. The apps include a free instructional Spinning video with Master Instructor Josh Taylor and a free online account at the Spinning Tracker website, spinningtracker.digifit.com. The apps are compatible with Digifit Connect, a wireless transceiver that communicates with ANT+ sensors like the Garmin heart-rate monitor and Spinning cadence sensor, and is also compatible with certain Bluetooth and Bluetooth Smart wireless sensors. Visit the Mad Dogg Athletics’ IHRSA booth #1924, March 15 and 16, for live demonstrations of the new Spinning app powered by Digifit. Home of Spinning®, Peak Pilates®, Resist-A-Ball®, and Bodyblade®, Mad Dogg Athletics is the world’s largest equipment-based education company. Mad Dogg Athletics has trained over 200,000 instructors and has reached millions of enthusiasts in over 80 countries worldwide through a network of over 35,000 fitness facilities and studios. The company manufactures Spinner® bikes, Pilates equipment and functional training products, DVDs, and a complete line of apparel and accessories. For additional information, visit http://www.maddogg.com. Digifit offers truly engaging health and fitness solutions using sensors and wearable technology integrated with mobile devices and the cloud so users can track activities anywhere, indoors or out, with a focus on heart rate training and monitoring. 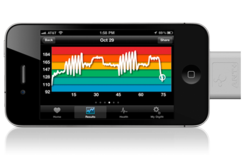 Founded in Santa Barbara, Digifit was the first app developer to bring heart-rate monitoring to the iPhone, and is dedicated to developing innovative applications, grounded in science and powered by technology, to help people develop healthy habits and lead healthier, happier and longer lives. For more information, visit http://www.digifit.com. IHRSA, the 'International Health, Racquet & Sportsclub Association, is the trade association serving the health and fitness club industry. IHRSA's mission is to grow, protect and promote the health and fitness industry, and to provide its members with benefits that will help them be more successful. IHRSA members represent health and fitness facilities, gyms, spas, sports clubs, and suppliers worldwide. IHRSA and its members are dedicated to making the world healthier through regular exercise and fitness promotion. For more information, visit http://www.ihrsa.org. Home of Spinning®, Peak Pilates®, Resist-A-Ball®, and Bodyblade®, Mad Dogg Athletics is the world’s largest equipment-based education company. Digifit offers truly engaging health and fitness solutions using sensors and wearable technology integrated with mobile devices and the cloud so users can track activities anywhere, indoors or out.